Situated in the centre of Saint Petersburg the State Hermitage Museum is housed in five magnificent buildings created by celebrated architects of the 18th to 19th century. The State Russian Museum is the world's largest museum of Russian art. The museum is housed in four palaces located in the historical center of Saint-Petersburg. St.Isaac's Cathedral is a remarkable monument of Russian architecture. This grand structure filled up the space of the Senate Square, and created a new square as well. 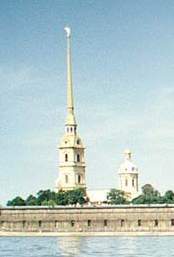 Alongside with the Peter and Paul's Cathedral and the Admiralty it became an important architectural landmark in the city outline. The Smolny ensemble includes a number of structures put up at different times. This territory on the Neva bank, opposite the Nienschanz Fortress put up by the Swedes in the 17th century, was allotted for the tar-yard (Smolianoi dvor). Nikolskiy Naval Cathedral is the masterpiece that combines baroque style with elements of traditional Russian architecture. It was built under project of architect S. Tchevakinskiy on the place of navy parade ground. The Peter and Paul Fortress is architectural and historical center of Saint Petersburg. The fortress was designed to protect the Neva lands that were won from the Swedes during the Northern War (1700 - 21). The Summer Gardens are almost as old as the city. It might date back to the early 1704, when on the order of Peter I they started to bring saplings of various trees, flower seeds, marble statues, columns, etc. to Petersburg from all parts of Russia and Europe.